It’s time for leaders in all organizations (non-profit, for-profit, healthcare, government, education, etc.) to get serious about how culture is impacting their performance. 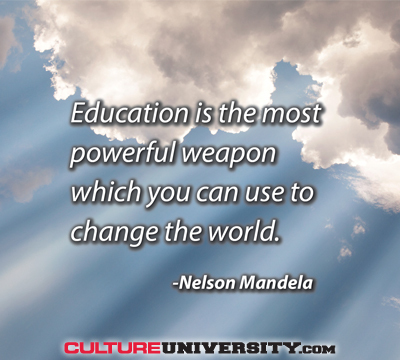 At Culture University we believe that all leaders need to build on that understanding, engage their organizations to harness the incredible power of culture, and strive to make a meaningful impact. When I personally think about the word culture I think about “impact.” Many leaders desire to make a meaningful impact in their organizations, yet no matter how successful they are, culture is always helping and holding them back from maximizing that impact. 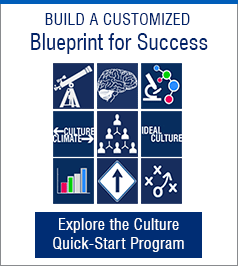 There are results to deliver, diseases to cure, people to educate, governments to change, and other meaningful improvements leaders desire to make, but most are not leveraging the power of organizational culture. This must change and it’s important to give leaders the knowledge to deal with the subject of culture with confidence. One might expect every CEO to have a sense of urgency to understand their culture as a basis for solving problems, dealing with challenges, avoiding the tragic consequences of bad behavior, driving out fear, and eliminating their own frustrations about managing work in their organization, but this is not the case. There are two visuals that capture important aspects of the culture change challenge, The Culture Circles and The Culture Curve. This visual and concept is adapted from Simon Sinek’s Golden Circle and his great Ted Talk on Leaders Inspire Action. Execution (Goals, Initiatives & Actions): Many organizations focus their “culture work” on this surface layer. This is no surprise since we are absolutely buried in popular press and over-simplified culture content. Recent headlines include “4 Ways to Fix a Broken Company Culture” and “12 Tips on Creating the Perfect Company Culture.” My favorite is “Affordable Ways to Improve Your Culture” that highlighted a Nerf gun fight example for improving your culture. Some of these concepts may be great actions, initiatives, or events but this surface level, focused on execution, must be clearly connected to supporting the two inner rings of the circle. Strategies & Systems: Some organizations focus on specific strategies or systems to support the culture they want to reinforce, or feel they need, to manage priorities, challenges, or goals. The focus may include specific systems or improvements for reward and recognition, communication, training, hiring, core operating processes for their products / services, and other areas. This focus often falls woefully short of truly building the strategy and supporting systems required to leverage their unique culture and manage change effectively. Culture Core – Purpose & Values: Some organizations do focus on the core or “heart” of their culture, their purpose and values. The purpose ideally captures why they exist and what’s special about how they support that purpose. The values should go beyond one word values and be clarified through stories, definitions, specific expected behaviors, or other approaches. Organizations need a framework of strategies and systems that reinforce, and provide a support structure of habits and routines for these values. A clear and shared “culture core” is not enough as evidenced by the non-profits, educational institutions, healthcare organizations, faith-based organizations, and others with a “shared purpose” that still struggle to maximize their potential, due to the lack of supporting strategies and operating systems. When leaders truly understand that all three circles are needed in order to maximize the potential of their organization in supporting their purpose and achieving the results they desire, real transformation can begin. There’s plenty of studies out there about the effectiveness of change efforts and most highlight that the majority of culture change initiatives fail. I don’t want to debate statistics but I believe most initiatives fail because 1) leaders either barely touch the surface of the changes needed to support the areas of The Culture Circles, or 2) their focus is to go deep with major improvements in one or two areas, resulting in no connection between the big change areas and the results they seek. The answer is actually found when organizations go shallow in the right areas, while making connections from that work to a major performance priority, goal, or challenge. The organization learns by the coordinated focus on one priority and applies what is learned to other performance priorities, problems, and challenges (but faster and more effectively the next time around). Unfortunately, most organizations implement various improvements and they never integrate enough of them as part of an overall strategy, to reach the tipping point where momentum builds, results grow, and the work gets easier. Nearly all of these areas need to be addressed before results clearly build and momentum grows. A major pitfall for many leaders is to focus on superficial changes, or go deep in a few specific areas, resulting in an inability to build the full support structure needed to make it past the tipping point. Awareness of the power of culture has grown but education on how to harness that power is limited. Leaders at all levels need a sense of urgency in understanding how their culture is supporting their purpose and impacting their results as a basis for action since culture and leadership are two sides of the same coin. It’s better for this action to be focused on a specific performance priority, problem, or goal, in order to build understanding, and accelerate buy-in that drives results. It can start with a leader at any level learning more about the culture fundamentals and holding that first meeting with their team to begin addressing the nine areas above in connection to the #1 priority in their organization, location, department, or team. Are you ready to schedule that meeting or to take action in some other way? What impact could leaders have if they are serious about culture and take action with confidence? Nelson Mandela said that “education is the most powerful weapon you can use to change the world.” Awareness of the power of culture is clearly growing but we need far more education and action. What do you think of these insights? Do you agree or disagree and what else can you add about translating culture awareness and education to meaningful action?